While resilient design and green building objectives do sometimes conflict—e.g., redundant systems that provide greater structural performance may increase environmental impact—they share many objectives. Supporting this conclusion, a study of buildings demolished in Minnesota found that most were demolished because of changing land values, changing tastes and needs, and lack of maintenance of non-structural components.12 In fact, wood buildings in the study were typically the oldest; the majority were older than 75 years. In contrast, more than half the concrete buildings fell into the 26-to-50-year category, and 80 percent of the steel buildings demolished were less than 50 years old. Overall, the fact that wood buildings had the longest lifespans shows that wood structural systems are fully capable of meeting a building’s longevity expectations. Although adaptability from a resilience perspective most often means climate change adaptation, the fact that a wood structure is easily adapted with basic construction tools could contribute to faster recovery in the aftermath of disaster. The Resilient Design Institute also includes the use of locally available, renewable or reclaimed resources among its design principles, which favors wood use. The Centre for Interactive Research on Sustainability at the University of British Columbia includes a number of features intended to enhance resilience. For example, a narrow footprint (30 feet) for the offices allowed full daylighting of office/lab zones, while operable windows provide natural ventilation. These two strategies mean the building can continue to be occupied during a temporary power outage or other unforeseen event. 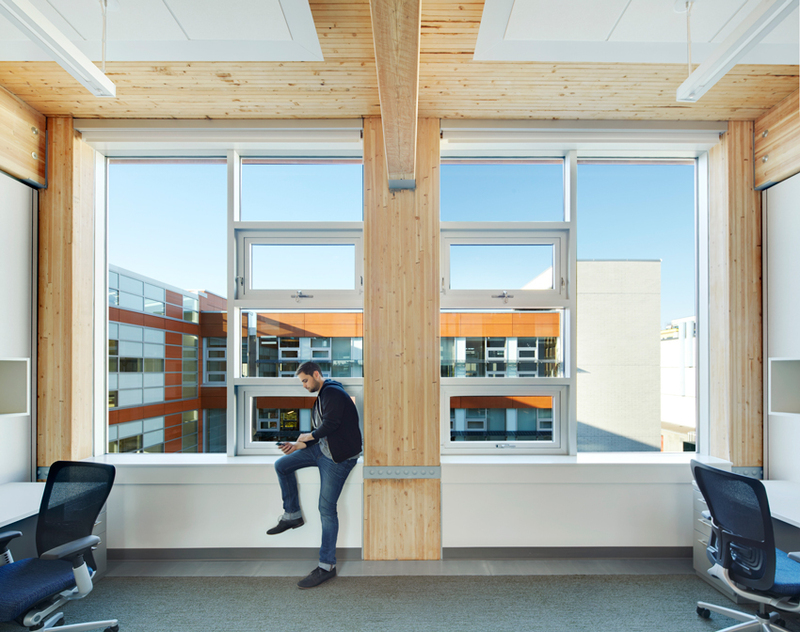 While wood was not directly responsible for the daylight and ventilation, an innovative wood moment frame was designed to permit large openings in the exterior wall to support these principles. Goals for the project also included a light carbon footprint (in this case, net zero operational carbon and structural carbon sequestration), which is cited by some as an important resilience objective. During design, Perkins+Will compared the carbon footprint of steel, concrete, and glued-laminated timber (glulam) for the building structure, and found that wood offered a clear advantage. Although the concept of ‘designing for resilience’ continues to evolve, a number of principles have been put forth by architects and engineers, as well as city planners and others involved in the design of buildings. PBD, where decisions are based on desired performance outcomes, is an alternative to the prescriptive approach of satisfying requirements prescribed in a building code for the structure to be deemed safe. Although the IBC contains many performance aspects (e.g., high risk category buildings are expected to perform better than lower risks category buildings), the concept of PBD generally refers to performance above code minimums or the use of alternative methods of design than those described in the building code. Whether a project is targeting code minimums or higher performance objectives, the approach for a wood building design involves the use of standards, such as the NDS and SDPWS. Life-cycle assessment is a method for measuring the environmental impacts of materials, assemblies, or buildings over their entire life cycles, from extraction or harvest of raw materials through manufacturing, transportation, installation, use, maintenance, and disposal or recycling. It allows building designers to compare alternate designs based on their environmental impacts and make informed choices about the materials they use. As with PBD, LCA is an alternative to the traditional prescriptive-based approach to material selection, but in the context of environmental instead of structural performance. An example would be specifying a material based on its actual environmental impacts instead of assuming that a product with recycled content is automatically better for the environment without considering its manufacturing process. Put briefly, a mix of the two involves working to identify a design solution that meets engineering, societal, environmental, and economic performance objectives. For many applications, that solution may well be a wood structure. In terms of engineering performance, this course includes several examples of buildings that perform beyond code minimums. LCA studies have also consistently shown that wood outperforms other building materials in environmental impact categories that include embodied energy, air and water pollution, and carbon footprint.14 Societal performance, which could be anything from corporate citizenship to business ethics, could be achieved in part through the use of a renewable resource from sustainably managed forests, and wood’s cost effectiveness could be the factor that allows a project with high engineering and environmental performance goals to pencil out. 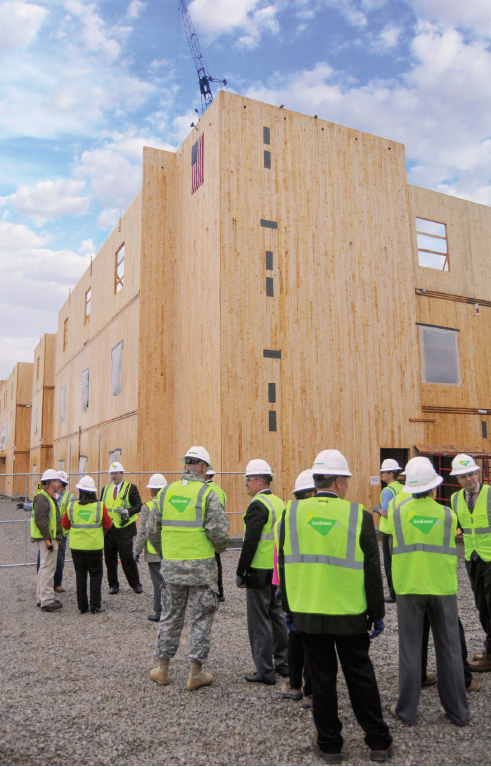 Made from CLT, the four-story Candlewood Suites Hotel at Redstone Arsenal, Alabama, had to meet Anti-Terrorism and Force Protection standards required for every structure built on a U.S. military base. Extensive engineering analysis was used to determine compliance with blast-resistance criteria.